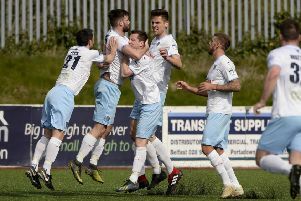 Ballymena United cruised to victory after a dominant performance at Stangmore Park. The game was won in the first half, with the visitors scoring four times. It saw Dungannon’s good run end, as Ballymena moved above them in the table. Ballymena took the lead after six minutes. Tony Kane crossed to the back post and Jonny Frazer’s header came back off the crossbar, with Darren Henderson nodding home. It got even better for the visitors when they capitalised on poor defending to make it 2-0 in the 16th minute. David Cushley’s corner wasn’t cleared, and Kyle McVey hammered home. Dungannon pulled themselves together and scored in the 22nd minute. Andrew Burns made a searing run down the right before pulling the ball across for Jamie Glackin to convert. But Ballymena’s two-goal lead was re-established when Henderson took a pass from Willie Faulkner, beat the offside trap and slotted home. And it became 4-1 in the 35th minute, Frazer heading home from Kane’s cross. Dungannon had chances to come back into the game in the second half, with Andrew Mitchell twice wasting decent opportunities. Mitchell did pull a second back in added time, but it was too little, much too late.